Although they may live up to two years in the lab, the average mouse in the wild lives only about 3 months, primarily due to heavy predation. Cats, wild dogs, foxes, birds of prey, snakes and even certain kinds of insects have been known to prey heavily upon mice. Nevertheless, due to its incredible adaptability to almost any environment, and its ability to live commensally with humans, the mouse is regarded to be the third most successful mammalian species living on Earth today, after humans and the rat. 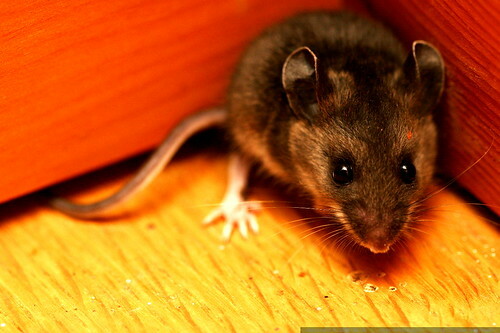 Mice can be harmful pests, damaging and eating crops and spreading diseases through their parasites and feces. In the Western United States, breathing dust that has come in contact with mouse feces has been linked to the deadly hantavirus. The original motivation for the domestication of cats is thought to have been for their predation of mice and their relatives, the rats. tacit brick: Very good and cool pictures. I wish I have one. most interesting [108 photos] most interesting images to-date, as scored by flickr and collected c/o dopiaza.org. we have two long-haired cats of unknown pedigree. rachel brought them home one day as a surprise, when we lived in a cramped little 1200 square foot house in san francisco. one black cat (count catual) and one white cat (spaceghost coast-to-coast). spaceghost usually manages to ditch her collar and prowl around with nothing on, which nets her more prey. catula is smaller and faster, but usually has the handicap of a jingle-bell collar to warn prey of her approach.